The New York couple decided early on they didn't want kids. Instead, they have their pups. These New York dogs have it all -- they wear the latest designer dog fashions and get to travel the world. Plus, they have no pesky human children to compete with. Fashionista dogs D.I.O.R. and Obi Wan are most well-known for their Instagram account @the_doggie_days. 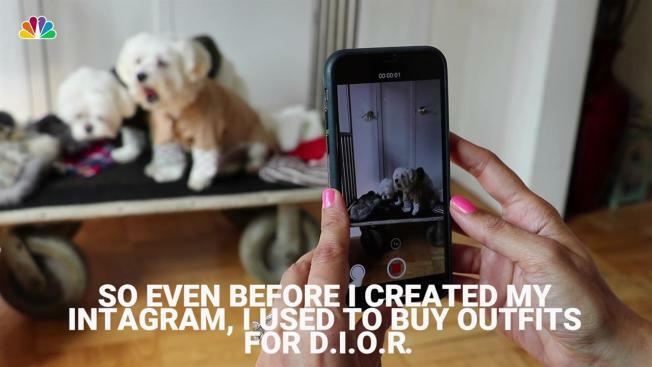 With 52,000 followers, the account showcases the dogs’ designer outfits, their hip New York life and exciting world travels. The fur-babies’ mom Gauri Sikka started the account when on bedrest in December 2015. Sikka says she has always had an interest in fashion for dogs as well as humans. With a busy New York lifestyle and a passion for travel, Sikka and her husband decided early on that they don’t want the responsibilities that come with having children. Instead, they have their pooches. The dogs are world travelers, and have been to Italy, Spain, France and Austria. They wear outfits from designer doggie clothing brands such as Eye of Dog and Max-Bone. According to Sikka, she spends anywhere from $10,000 annually on the puppies. But coming home to her dogs makes it all worthwhile. “They are waiting at the door when we come home. So it’s the best feeling. You walk in and they are so happy to see you. No human would be that happy to see you,” Sikka says. Watch the video above to see how these sartorially-blessed pups are living large in New York City.